When purchasing a home for investment with the intent to Hold (Rent) you need to consider your Monthly Cashflow. Why is it important and what is it? Before purchasing for the purpose of Renting you must know your cashflow, it can either give you positive cashflow or negative. In plain words either make you money or loose it. 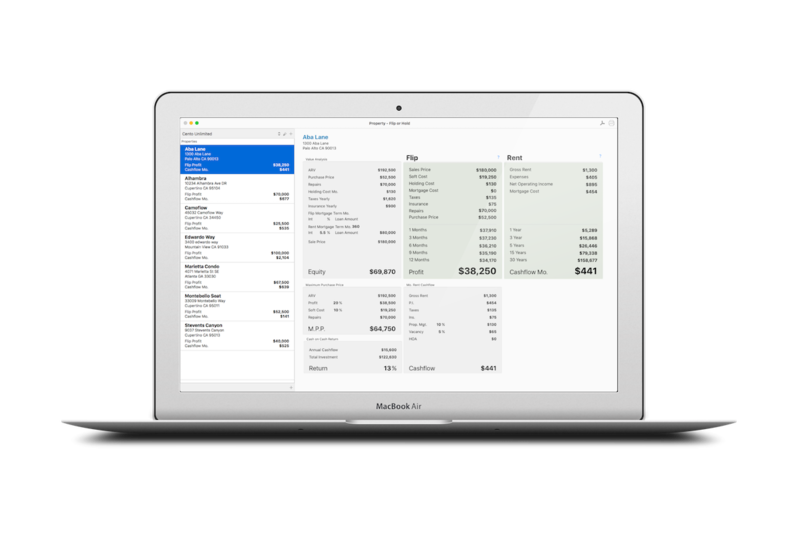 Cashflow is fairly straight forward to calculate and its your Gross Rent minus all of your expenses including Mortgages. Where some Real Estate Investors can get into trouble is not looking at all of your expenses. For example forgetting to factor HOA (Home Owners Association Fees) or hidden expenses like being responsible for pool maintenance instead of the tenant. Gross Rent – This is your monthly rent that the tenant will pay. A good estimate in most cases is 1% of the property value. In our case its $1,300. P.I. – Monthly Principal and Interest payment if you obtain a Mortgage which is $454. Taxes – Yearly Property Taxes are $1,620 and we will divide by 12 which gives us a monthly payment of $135. Insurance – Take the Yearly Property Insurance and divide by 12 which gives us a monthly payment of $75. Property Management – Usually the Property Management fee is 10% monthly which gives us a monthly payment of $130. I always use a Property Management Company and when I purchase a property I always factor it. Vacancy Factor – Usually the Vacancy factor is between 3-5% and I always use 5% to be safe. In some areas it would be less and some more. It is very important to always take the Vacancy factor into consideration because the property will not be rented 100% of the time, very rare. In our case it’s $65 monthly. HOA – If you are looking at a property where there is an Home Owner’s Association fee make sure you take it into consideration. In our case we do not have one. Cashflow – This is the Big number that can make or break a deal. 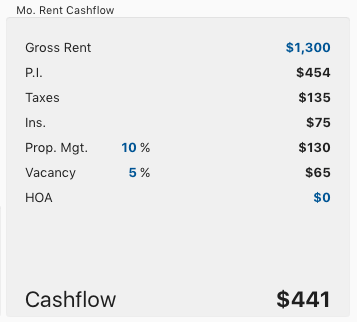 Cashflow is calculated by taking the Gross Rent – P.I. – Taxes – Insurance – Property Management – Vacancy Factor – HOA which gives us a Cashflow (Profit) of $441 monthly. Nice… What if this number was a negative number? Then it’s not worth purchasing because you will loose money monthly. It’s time to put it all together and see what our Cashflow should be.